Whitewater rafting on California's Main Tuolumne and Cherry Creek is possible at a wide range of flows. The higher the water, the more difficult these whitewater rafting runs become. All Flows are measured in "cubic feet per second or cfs". Be sure to check the flows before you take off on an adventure on either of these rivers, too much or not enough water can create unexpected hazards. The Tuolumne has a longer whitewater rafting season than Cherry Creek. The creek becomes extremely dangerous at flows above 2000 cfs and should only be run once the winter snowpack has finished melting. 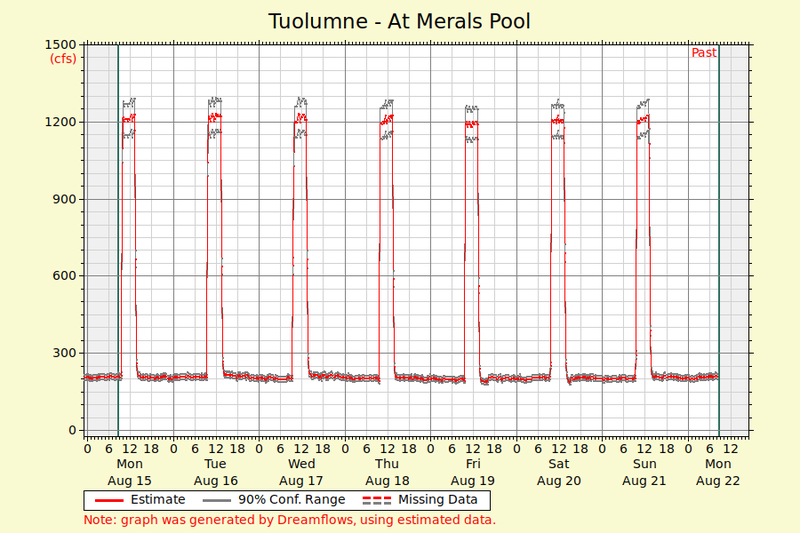 The Tuolumne usually runs from March to October. Consistent flows are controlled by the upstream reservoirs in the summertime with added runoff in the spring. The spring runoff turns the Tuolumne into an extremely challenging high water run; the rapids become longer, the waves and holes more powerful, and the consequences that much greater. On the flip-side, lower water runs in late September make this river very technical with huge wrap rocks strewn throughout the river. Cherry Creek can be run from late July through September. Cherry Creek should not be run during the months of increased runoff. This advanced/expert whitewater rafting run can only be attempted when lower water flows occur, usually in late summer. Consistent releases are controlled by an upstream reservoir providing optimal summertime flows.